Have an old android phone here. Chrome browser could log in but it was difficult to read the page because of inconsistent font sizing. I switched to Dolphin browser which renders the sked page perfectly. Yes, Dolphin browser is a free browser in the Google play store. #Cootie Finger tip of side of finger? I have a video I did a while ago to show the method I use when sending on a sideswiper - it's not a good video to show the rolling of the wrist because the video was to show the method of starting out with the "same side motion as a bug" method I use. 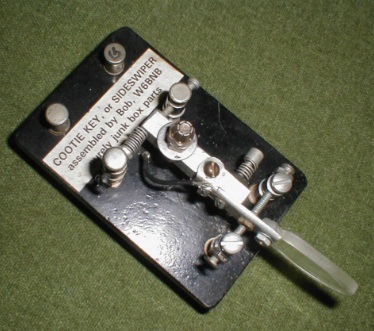 Here's the video of me sending on a Russian KDM key - it was a shipboard key used by Russian Radio Officers, a nice key. I'm going to post this and other instructional videos in another message to the group. Maybe they will be interested in them. You will see the rolling wrist motion I use, it's difficult to photograph but I think the bug videos catches it. It's very easy to do on the bug because there are NO short motions - the dots are automatic and the dashes are three times as long as the dots. Where the rolling really helps is in making the dashes easier. The quality isn't very good but I did the best I could with the inexpensive equipment I had. The feet on my bug are dry, and are on the verge of cracking. Looking at how the feet are mounted, they appear to be attached with rivets. I tried turning one of the feet, but it just spins around. Does anyone have experience with replacing the feet? I have no problem with drilling/tapping to accomodate new feet - I just wanted to know if there were any tricks to removing the old ones before I apply brute-force destructive methods. Here is a link to replacement ‘bumpers’ as they are called. According to the description, the bumbers are screwed onto studs. By that description I would presume that the old ones just spin off and the new spun on. Les Logan used 4 feet on his keys and the 4 feet can cause the key to wobble if they are not all perfectly level. Most all speed keys come with 3 feet since they are self leveling. So its odd Les Logan never caught onto it..
And your correct, removing the 4 old feet is difficult due to the rivets freezing up. So what I do is simply leave the 4 old feet in place and instead use 3 self sticking on feet that are slightly higher..
You can find many sources for the self sticking feet off Ebay and Amazon. They have an adhesive on the bottom. I've done that on quite a few Les Logans and find its the best solution. Plus you can pick up an entire sheet of the self adhesive rubber feet and use them on other projects around the house!!!! Forgive me if this is a silly question ..Is there a CW abbreviation for Merry Christmas? Being a relative new CW OP, and having now sent and had sent to me "Merry Christmas to u es urs" now quite a few times, It puzzled me where this isn't a CW abbreviation for this. Thanks to Kate K6HTN for bringing to our attention ARL 61. Never having been a cw traffic handler I was unaware of the ARL codes. ARL SIXTY ONE: Wishing you a very Merry Christmas and a Happy New Year. I'll start using these immediately....For 57 years I've been pounding out Merry Christmas and HNY. Well, if anyone contacts me during the Christmas season please do not send something as cold as ARL 61. If you don't have the time to send "Merry XMAS es HNY" then don't bother to take some of your precious time to contact me in the first place. Been using, and hearing "MX" all day. What about HOHO instead of HIHI? HOHO creates BIG smile for me! As an aside (and completely out of keeping with CW operating), I am not comfortable with many abbreviations (old school thinking exacerbated by 'new language' created and used by sheeple using mobile device messaging) but am comfortable with using Q codes. Of all places, while surfing Amazon for Christmas stuff I stumbled upon this 20W all mode 9-Band portable rig for under $500. I know nothing about it other than what is printed in the attached ad. It might be worth consideration as what appears to be an affordable match for SKCC folks looking for a budget rig. Check it ou and report back in case others here can benefit from your knowledge. I just bought one of these radios, along with the matching amplifier. I'm not ready to do a comprehensive review just yet, still exploring operating features, capabilities, and limitations. So far It's a very straightforward, easy to use, radio. The set I have was purchased from Connect Systems Inc. It's the CS 108 G, and has some features unique to this version, one of which is coverage of the 60M band.Other versions may skip 60M. CSI also gives you a one year warranty. and also a few eBay "buy it now" listings (same price as Amazon). If you don't mind supplying a box and hooking up pots, etc. hfsignals.com had just announced the uBitx. It is a 10W SSB/CW radio in a kit form. All of the hard stuff is done for you. $129 for a multiband rig ($109 if you order before Christmas). They have sold out and an order backlog is growing. Again, this is for a populated board and pots, etc. Hacking may be desired later to add features. But it seems to be a great buy. I built the BITX40 single 40M band version from HFSignals.com last year. It can run between 5-10 watts depending on drive voltage. The BITX40 was only SSB, but could be hacked to add CW, but I did not go that far. I had mine up and running in a hour or two just laid out on the desk, even make two DX contacts with it. It is just hooking up some premade wiring, some drilling and cutting of a case, and installing connectors and pots in the case. Great little build, and very good sounding receiver. I order the multi-band uBITX (microBITX) the other day before they were sold out of first run, can't wait to built this one up. The new rigs do CW and I look forward to using it on SKCC stuff! They are taking preorders for the next batch of these transceivers now. They said it will take about two weeks to get the new boards in, and another two weeks to populate the board and ready them for shipping. I'm actually very tempted by this, even though I already have a KX3, and a K2/100, and a newly acquired Kenwood TS-440SAT (the radio I lusted after when I first got licensed. This is especially interesting, since someone modified the firmware so that the BITX40 would speak its settings and such. Don't see why this shouldn't be possible to do with the all-band model. Be a nice little project, especially since I think I could even get some help building it. No, of course I don't expect it to be a KX3 or a K2, but it still sounds like a whole lot of fun. - a Canadian net on 7.055 MHz LSB. The net’s SSB bandwidth covers from 7.0518 to 7.0550 MHz. There website says they started in 1982 though I’ve only noticed them for several months now and there activity seems to be growing. This is an hourly net from 1300z to 2200z weekdays. I have also noticed activity at other times as well. Many of our members operate in that range of frequencies but when the net is in operation I usually cannot copy them. DISCLAIMER: I am not being critical of this net. They have every right to be there. My intent is to inform SKCC members to avoid these frequencies if you want to be heard. Yes the Ontario SSB Net is on nearly every day, the amount of activity varies from day to day. If you are on the right receiver sideband and transmit right on 7055.00 they can not hear you and you should not hear them. If you operate on or above 7055.00 there should be no conflict. 7052-7055 will interfere with them. I had just about enough time to get my Sausage Egg McMuffin before I had to get to work. As I walked towards the counter I noticed there was a line of people waiting. Standing at the front was a very nice gentleman who just began to give his order. After he finished paying, the cashier gave him his order and politely thanked him for coming. The man continued to say thank you and repeated how he placed his order, how the cashier took their order and wished the cashier a very nice day. You would think that would be the end, but it wasn’t. The cashier thanked him for thanking him and they both continued to exchange well wishes. I glanced at my watch (yes, people do still wear them) and noticed three minutes had passed. The next person walked up and the same thing happened. They both exchanged pleasantries after the sale was made. Again, the second person got their order and continued to say how wonderful their product was and wished them a happy day. The cashier being a professional, hanked the customer for thanking him. I was now third in line. Doing the math, it wasn’t worth it. It would be several minutes before I got to the counter. I went to Taco Bell instead. How is this relevant to Ham Radio or SKCC sprints? By now you must have connected the dots (and dits). Once an exchange is made, the calling station will say “GL and TU” and then give some form of ending. A simple “TU dit dit” is really all that is needed as a reply back. Possibly a little more, but not much more. Replying with a “<HIS-CALL de YOURCALL> GL and TNX FER THE QSO. 73 AND TAKE CARE <HIS-CALL de YOURCALL>” only ties up the ether. With how fast the bands change this time of year, life is too short. Don’t we all just want our Egg McMuffin? If you can't heard an DX station....don't call 'em in the first place. If you are not familiar with the story, the last voyage of the Prinsendam as related by N1EA is fascinating. It was the last SOS to be sent by the world's ships. and gave me a whole new appreciation of the problems of the marine ops who sail in the aurora zones. I keep going back to it to check out my copying skills. After a lot of practice, when I am on my game I can copy most of the recording. All the shipboard ops have my admiration, their skill was amazing. I have acquired Bob Shrader's favorite cootie, built from junk box parts. It works nicely, the little rubber feet might need to be re-glued or I can get some new sticky type press on feet. If anyone is interested, make me an offer off the list. A very interesting addendum to the excellent BBC program. Well done mon vieux Jos, MCI BCP!